Democrats have found this week that maybe they can't handle the truth--honest accounting of Obamacare and its impact on private sector and jobs! "Remember the Enron scandal in 2001, which drove a bipartisan majority in Congress to demand far-reaching reforms in corporate accounting? Democrats have discovered this week that maybe they can't handle the truth -- at least not when it exposes the real economic effect of Obamacare on private sector companies large and small. Thousands of employees, their families and retirees get their health insurance coverage through firms that are now having to figure out how to cope with government-run health care..."
A Washington Post poll goes inside the numbers and discovers this, according to Byron York's article: "Inside the numbers, Independents' oppostion to Obamacare is bad news for Dems"
"...The Post’s polling director, Jon Cohen, graciously gave me the partisan breakdowns of the poll’s health care questions. And they show this: Republicans hate the new law. Democrats love it, but not as much as Republicans hate it. And independents really, really don’t like it...". US Ambassador Tom Schweich and a group of young conservatives, Mortgage Youth, unite in this vocal and guitar rendition "Gimme Back My Freedom". Vocals and lead guitar, music and lyrics by Tom Schweich. The Republican Song - Please Don't Vote for a Democrat! KCMO Talk Radio 710, along with Americans for Prosperity and PoliticalChips.org, present the "Taking Our Country Back Tour", April 10th at the Sprint Center. Chris Stigall, local radio personality and conservative talk show host, will be one of the headliners. The tour features Sean Hannity, Laura Ingraham, Karl Rove, and John Rich. Go to this site to listen to audio about the concert and to BUY TICKETS. 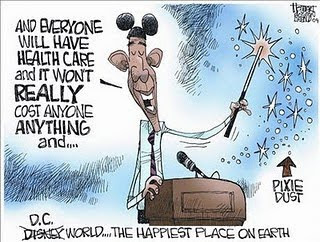 No mandatory health care, trillions of new jobs, and low-emissions unicorns, change as promised?--April Fools!